I had a very unusual Saturday. Together with Dzifa Benson, Jacqueline Saphra and Dominic O’Rourke, I took part in a poetry performance at Tate Britain as part of the Tate’s Going Public event series. 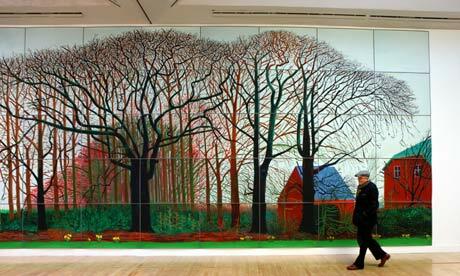 Our piece, In The Undergrowth, was a response to David Hockney’s Bigger Trees Near Warter. We performed in front of the artwork itself – or rather, inside the artwork. The whole piece is a room hosting three images of the same enormous painting: a copse of sycamores in rural Yorkshire. As we performed our poems, the paintings became backdrops and we became characters: experiencing, creating and interpreting the trees in our different ways. 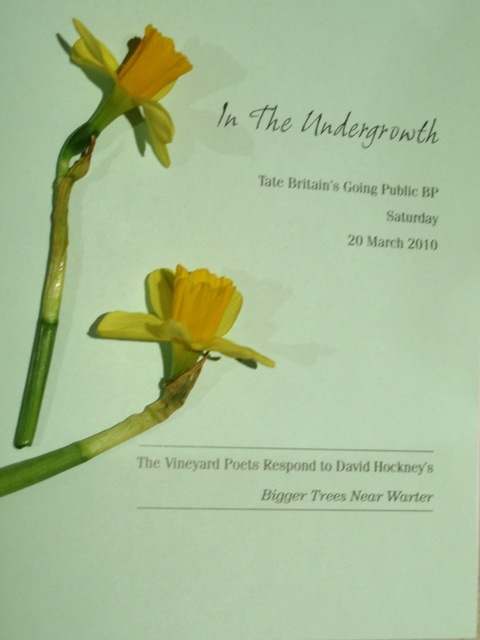 The audience responded brilliantly – some reading along with the In The Undergrowth pamphlet we published, which features ten poets from The Vineyard poetry collective. It was wonderful to perform together in such an evocative setting. I particularly loved watching the children who came to the performance. Because I work mainly in secondary schools, I rarely get to perform for younger children, so seeing their mesmerized faces throughout the day will stick in my mind. It was also an exercise in stamina – we performed six times during the afternoon, and had to give everything of ourselves to keep the energy high. But that was what made it work so well. Each performance was different and by the end of it, I felt I’d learnt so much about performing, about the artworks themselves and about communicating with an audience in a dynamic setting. I would love to see more work like this being commissioned. A gallery can make a powerful performance space. One of the best comments I heard from the audience was that our performance brought life to the paintings, and that as we spoke they perceived more and more layers to the images. A creative way to engage with and respond to art – well beyond the confines of the gallery lecture! This entry was posted in Performances and tagged Bigger Trees Near Warter, David Hockney, Dominic O'Rourke, Dzifa Benson, In the Undergrowth, Jacob Sam-La Rose, Jacqueline Saphra, Miriam Nash, Performance Poetry, Tate Britain, Tate Going Public, The Vineyard Poets. Bookmark the permalink. It was an inspirational – if exhausting – day. Was a privilege to perform with you.